The current article serves as an introduction to the subject of Deleting mail items using the Search-Mailbox cmdlet. In this article, we review some various scenarios of using the Search-Mailbox cmdlet for deleting mail items from multiple Exchange mailboxes (Bulk Deletion). In the next article – Delete mail items from Single Exchange mailbox using PowerShell | Part 5#5, we review a various scenario of using Search-Mailbox cmdlet for deleting mail items from a single Exchange. A scenario in which a virus attacks your organization recipient. You need that the Virus sent for a couple of Exchange recipient, but you don’t know who is this recipient. In this case, we would like to use the Search-Mailbox cmdlet for performing a search in ALL Exchange mailboxes looking for the virus file name, and after we locate this mail item, delete the mail items from the user mailbox. 2. A sensitive E-mail message that was sent by mistake to multiple recipients. A scenario in which Exchange recipient sent by mistake a “sensitive E-mail message” to the recipients who were not supposed to read the specific mail item. And again, in this case, we would like to use the Search-Mailbox cmdlet for performing a search in ALL Exchange mailboxes and “remove” (delete) this mail item. the Target Mailbox + The Target Folder. Target Mailbox + The Target Folder. In this scenario, we wish to generate a report (Log file) which includes details about the mail items that we are “going to delete but without performing any “action” beside of the generating the report. After we look at the information that appears in the report (Log) and after we “approve” to delete the specific mail items only then, go back and use one of the options mentioned above (delete the mail items without saving a copy or save a copy of the deleted mail items in the Target Mailbox). Perform a search in Multiple Exchange mailboxes (Bulk Mailbox search). The search is implemented by defining a specific Search Query (search criteria), that will help us to locate specific mail items that answer the Search Query. The Search Results (deleted mail items) will be copied to a Target Mailbox, and saved in a dedicated folder (Target Folder). In addition, we want to create a detailed report (Log), about each mail items that appear in the Search Results, and that was Deleted (the Log \ Report file will be saved in the Target Folder). The Source Mailboxes (the mailboxes on which we perform the search) are ALL Exchange Mailboxes. The Target Folder name will be – Search Results Multiple Mailbox search – DELETED mail item’s Backup. Cleaning the Recovery mail folder (the Dumpster). The Search-Mailbox cmdlet has the ability, to delete mail items stored in the Recovery mail folder (the Dumpster). Deletion – the folder that store Soft Deleted mail items. Purges – the folder that store Hard Deleted mail items. It is important to mention that in case that we use the Search-Mailbox cmdlet for deleting mail items stored in the Recovery mail folder (the Dumpster); the Search-Mailbox cmdlet can only delete mail items that stored in the Deletion folder (the folder that store Soft Deleted mail items) but cannot delete mail items that are stored in the Purges folder (the folder that store Hard Deleted mail items). In the current article, we review how to use the Search-Mailbox cmdlet for performing a search + mail deletion of mail items that are stored on a “group” or “array” of Exchange mailboxes. 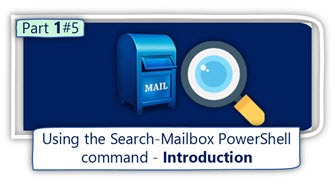 In other words, we have many options for defining the mailbox’s search scope. After we define the characters or the specific mailbox “Group” (multiple mailboxes), we “pipe” the Exchange mailbox group to the Search-Mailbox PowerShell command. 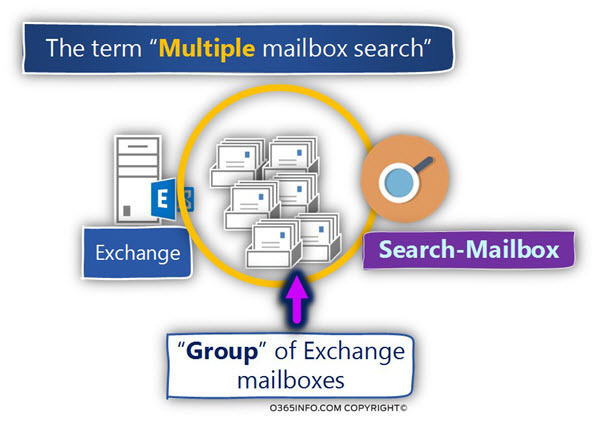 There many options that we can use for defining a specific “group” of Exchange mailboxes. 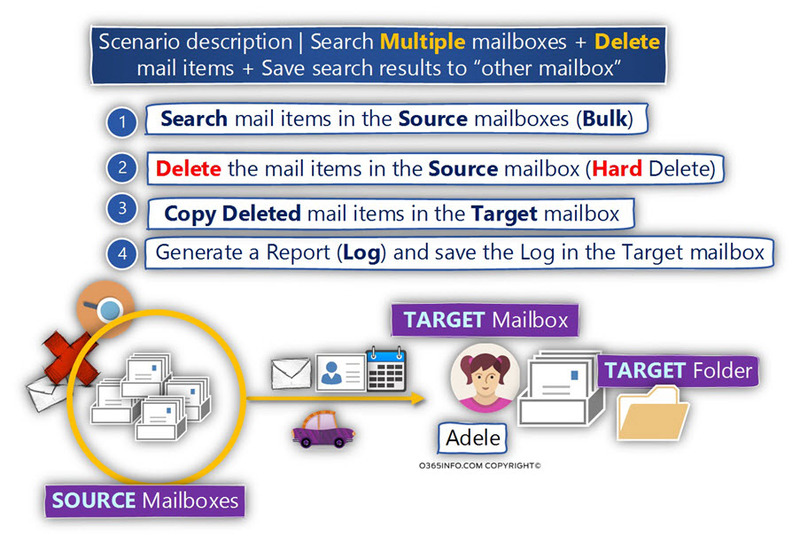 Example 1 – Perform Multiple mailbox search | All types of Exchange mailboxes. In this scenario, we want to perform a search by defining a “group of Exchange mailboxes” which “belong” (members) to a specific Distribution Group. Look (search), only a specific type of mail items (such as calendar or contact mail items) in a multiple Source Mailboxes (Exchange mailboxes). Search + Delete mail items with Sent on a specific Date Range. Search + Delete mail items that was Sent from a specific Sender (the FROM mail felid). Search + Delete mail items, that their size is “bigger” (grater) than a specific size.